Back in 1991 ‘Johnno’ Johnston headed off to the Yorktown Square Market in Launceston, Tasmania. He took with him six jars of home made raspberry jam and six orange cakes, made by his mother, Phyllis. Johnno’s intention was to sell the goods his mother had made to market goers – and he did just that! We proudly use local Tasmanian berries , stone fruit and vegetables from local Tasmanian suppliers. 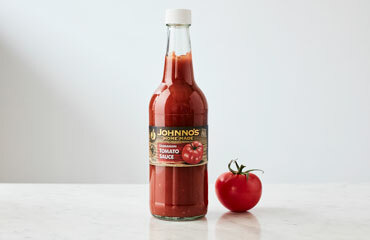 Follow us to find out where we sell our home made jams & sauces and what we’re cooking up next. Owner Glenn’s favourite. 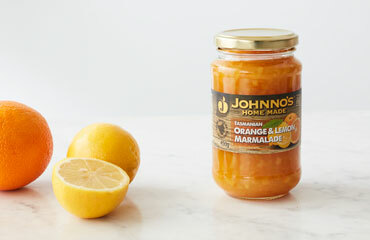 Johnno’s Orange and Lemon Marmalade is not too runny, but not to stiff. Tangy, tasty goodness! To enquire about buying or stocking our range, please contact us and we’ll get straight back to you!